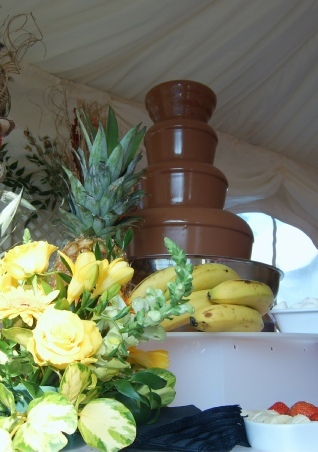 Chocolate fountain hire. An attraction which is a great draw for clients craving a chocolate fix. 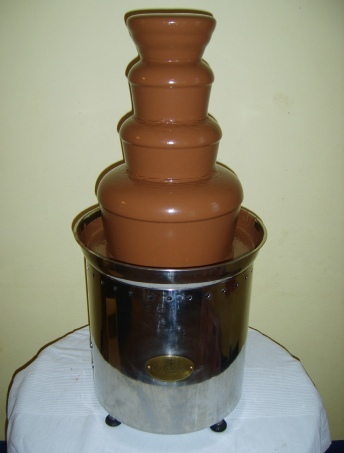 These fountains, heats the Belgian chocolate up in the retaining bowl, until it is liquid chocolate. When the fountain motor is switched on, the melted chocolate is drawn up centre pillar by an internal arguer and flows over the brim, cascading over the different size rims, forming the incredible visual effect of seamless flowing fountain. This a beautiful sight and of course the taste and the smell of delicious Belgian chocolate is irresistible to many and for some people; Moorish. An easy maintenance item for a trade stand attraction that can be a delight for almost everyone. Power requirement: 230 volts. 850 watts. 3.5 amps. Base motor unit 420mm diameter. Top of normal fountain; 900mm. With extension 1140mm. Illuminated Base 1200mm (diameter) x 1750mm. 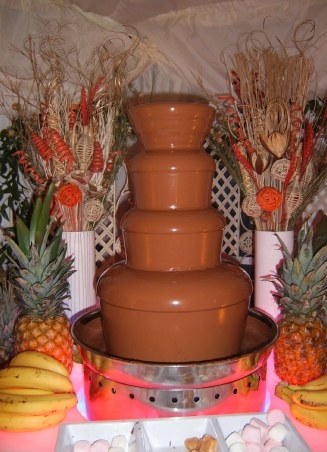 Promotion area: Base of chocolate fountain 450mm x 410mm. (diameter). Alexandra Palace, Business Design Centre, Dorney Lake, Bournemouth International Centre, Donington Exhibition Centre, Donington Park, Earls Court, Epsom Downs Racecourse ExCeL, G-Mex Centre, Hilton Brighton Metropole Hotel, Manchester Central Convention Complex, Novotel London West, National Exhibition Centre, Old Billingsgate, Olympia, Queen Elizabeth II Conference Centre, Ricoh Arena, The Royal Armouries Museum, Sandown Park Exhibition and Conference Centre, Stoneleigh Park, Telford International Centre, The O2 Arena, The Brighton Centre, Cardiff International Arena, Brunel University.